And a few more thank-you’s: Thank you designer Nick Crow, for making the page look so perfect; thank you to Diane Szukovathy and Dennis Westphall of Jello Mold Farm, for sharing your location (and great dahlias!) for the fun day of portrait work — and especially: thank you, talented photographer Mary Grace Long, for the nice image. No one likes to have their photo taken and you made it a blast! 1. What gives you the most pleasure in the garden (keep it clean)? Long ago, my friend Mary Robson, who has trained thousands of Master Gardeners in our area, taught me the most important way to enjoy the garden. “Be an observer,” she said. When I see the large and small changes that occur as the seasons come and go, I take pleasure in just being an observer. There are instances when I catch my breath and feel my heart race because a little bud is perfectly backlit at dawn or a tiny bird is perched on the fountain’s edge, giving herself a splash. Those fleeting moments of beauty mark the seasons and turn something ordinary in to a priceless gift from nature. 2. When did you first become interested in gardening? Like many children, I dabbled in the dirt alongside my grandparents. My own parents weren’t gardeners, but my paternal grandfather was famous in our family for his peonies and my maternal grandfather was equally famous for his prize dahlias. So I think flower gardening skipped a generation and now I’m channeling my grandfathers’ practice of maintaining a personal cutting garden. In my twenties, my interest in growing and gardening expanded into unbridled passion – thanks to two close friends who are both landscape designers (Karen Page, my college roommate, and Jean Zaputil, who I worked with at a textile design firm in the 1980s). I learned a lot from them. I call them my garden muses. Lucky for me, I’m a writer, so I’ve been educated while also interviewing famous gardeners and writing about incredible landscape designs. 3. What’s the best garden advice anyone’s ever given you? Van Bobbitt, who taught many of the horticulture classes I took at South Seattle Community College, was one of the first people to talk to me about natural gardening practices. He introduced his students to the idea that if a plant is failing or under stress you should evaluate its cultural conditions rather than just dosing it with a pesticide or fungicide. That excellent advice has empowered me to stop blaming the plant and start looking at the larger environment. More often than not, it’s the “right plant” in the “wrong place.” And there’s an easy solution to that problem. 4. What—if anything—do you enjoy listening to while in the garden? (Me? Dusty Springfield, Terry Gross, and birdsong.) Do you have a playlist? My playlist is in my head, James. As a writer forced to operate in the world of social media, I have far too many external stimuli – nearly all digital and electronic in nature. The restful quiet of being outdoors is simply too rare – I cherish it. I find that while I am tending to my garden, I reflect, imagine and dream. Whatever inner conversation I have, it’s always a rewarding one. 5. What does being a country gardener mean to you? Greater Seattle’s population is 3.7 million people, so I definitely live in an urban setting. But being a “country gardener” is a state of mind, right? I think it means having a conscious connection to the parcel of land where I garden, no matter if it’s on a busy street or under the flight pattern of the airport. 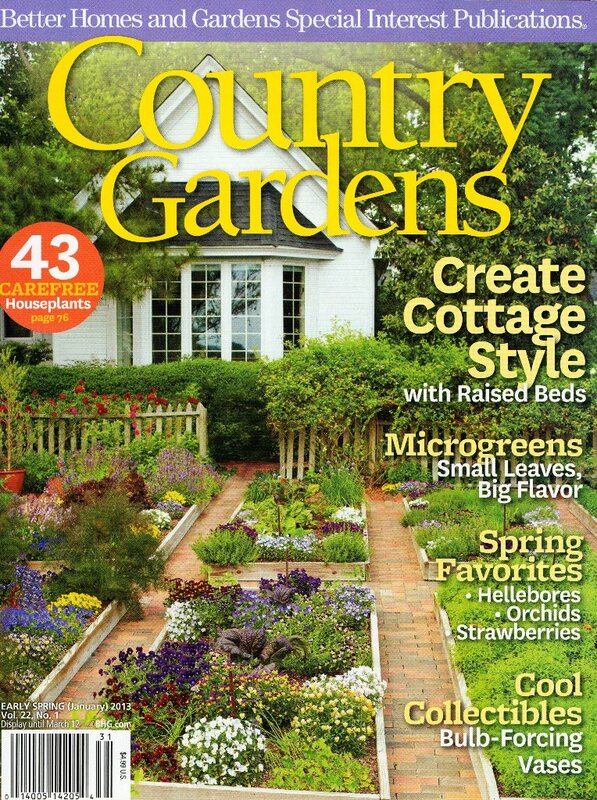 My favorite quote explains my “country gardener” philosophy: “…surely, if you are privileged to own a plot of earth, it is your duty, both to God and man, to make it beautiful.” — Beverley Nichols, 20th century English writer. 6. What inspired your newest book, The 50-Mile Bouquet: Seasonal, Local, and Sustainable Flowers? Seattle photographer David Perry and I collaborated on a storytelling project to document the groundbreaking changes taking place in the cut flower industry. It began in 2006 when we met several local flower farmers who were growing gorgeous, uncommon ingredients — and they had to work hard to break through the traditional “wholesale” marketing machine to sell their crops direct to area florists. We soon realized there were similar stories of intrepid flower farmers and nontraditional floral designers all around the country. 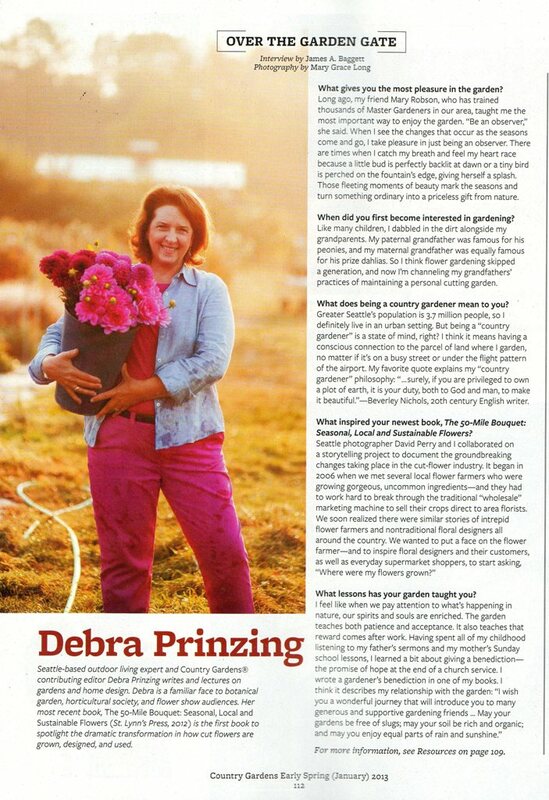 We wanted to put a face on the flower farmer – and to inspire floral designers and their customers, as well as everyday supermarket shoppers, to start asking “where were my flowers grown?” and “who grew them?” It turns out that the field-to-vase movement is as exciting as the culinary world’s farm-to-table movement. 7. How are you enjoying gardening in the Pacific Northwest as opposed to Southern California? What are the differences? I gardened in Seattle for more than 20 years and then, all of a sudden, in 2006, we moved to Southern California for my husband’s work. It was a huge shock to my system and yet, from a gardener’s perspective, it was exhilarating because I learned an entire new plant palette. My garden in Thousand Oaks, California, had all sorts of cool California native perennials, grasses, and shrubs; succulents, aloes and cactuses; and plants from other Mediterranean regions like South Africa and Australia. It was like taking a crash course in low-water gardening. And just when I started to figure things out, we returned to Seattle in 2010. So I’m back to shade gardening and zonal denial. Every single time I fly back to Seattle from my frequent SoCal trips, I have a little pot of something wonderful in my carryon. That’s the benefit of having a spot in my garage to shelter everything that’s not winter-hardy during Seattle’s cold, wet season. So far, my California succulents have made it through two Seattle winters, so I think my method is working. There’s a benefit to having lived both in the Northwest and the Southwest: I now feel like I’m a true gardener of the West. And that feeling is enhanced by the wonderful community of fellow gardeners I’ve found wherever I live. 8. Describe your dream garden for us. I have my dream garden. It’s a beautiful series of mixed borders and flower beds with a fish pond (which I inherited and am learning to care for), a white pergola and a covered porch with vintage white wicker furniture and an outdoor fireplace. I even have a peek-a-boo view of Lake Washington that greets me every morning. My husband, Bruce Brooks, is great with the lawnmower, too. My only other “dream” would be to have a full-time gardener to keep up with the weeding, dead-heading and other chores. 9. What lessons has your garden taught you? 10. What’s next on your green-hearted agenda? I’m wrapping up a solo project, which is a sequel of sorts to “The 50 Mile Bouquet.” Called “Slow Flowers: Four Seasons of Locally Grown Bouquets from the Garden, Meadow and Farm,” it will be published February 2013 by St. Lynn’s Press. I challenged myself to design and photograph one bouquet every week for an entire year. I only used ingredients from my garden or those grown and harvested by local flower farmers, even in the coldest months when most people assume there’s nothing available. In the process, I discovered that gardeners are ideally suited for floral design. We know the habit, form, peak of bloom and best qualities of the plants we grow – and we know how to combine them with in the landscape, so why not in a vase? 11. Anything else you would like to add that I’ve neglected to ask? 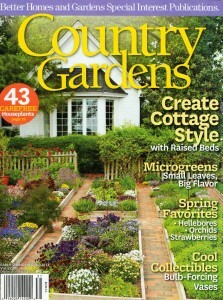 For the past five or six years, the grow-it-yourself trend has dominated the gardening world. And that has resulted in the pendulum swinging far towards the edible side of things. While many think it’s frivolous to grow flowers or care about how/where they were grown (i.e., the carbon footprint of imported flowers), I think the conversation is changing. Even though we don’t eat flowers, we do need their presence in our gardens – if only as a nectar source for pollinators or a seed source for birds. There is an important equilibrium that takes place when flowers – annuals, perennials and biennials – are cultivated, especially in the vegetable garden. You might be motivated to grow flowers for economic reasons, or to preserve heirloom varieties, or to attract beneficial insects. Whatever your reason, we need flowers in our lives, and in our gardens. This entry was posted on Monday, January 7th, 2013 at 10:29 pm	and is filed under Creativity, floral design, Gardening, General, Writing. You can follow any responses to this entry through the RSS 2.0 feed. You can leave a response, or trackback from your own site.